We recently went on holiday to the ‘winterless north’ of New Zealand. When you’re retired the word “holiday” doesn’t have the same ring to it or the appeal that it once had and the old NAC slogan ‘flying is the way to travel’ now makes good sense. We drove on the roads and from Taupo north they are nightmarish with articulated trucks and campervans sharing the highway with cars and passing lanes seemingly few and far between. One of the reasons for the journey was to visit relations who have built a new house overlooking the Kaipara Harbour north of Auckland. Our timing was a bit astray as the house was unfinished and the landscaping non-existent. Adding to that, the Kaipara is less picturesque than it sounds. We had intended to venture further to the Bay of Islands, but Northland’s roads are narrow and only two-way with a number of one-way bridges that National promised to fix when they were fighting off Winston at the election-before-last. Winston won on that occasion, so the promised bridges have never materialised. We realised we’d have to encounter the same traffic snarl-ups on the home stretch so it made no sense to carry on. We overnighted at Dargaville and came back through John Key’s old electorate, Helensville. It seemed a world away from Parnell, where Key actually lived and if names mean anything it should surely have been Ms Clark’s constituency. In Auckland we went through the new Waterview tunnel which is inaptly named as there is no water within sight which is just as well as it dips down rather frighteningly as you enter and is eventually 45 meters underground. I understand it is built below housing estates so some of them must have had vast basements that needed to be avoided. We came back through Rotorua and Taupo with a fleeting glance at Tauranga. No need to describe Auckland’s traffic, we regularly view it on TV news channels, but I can report that poor old Tauranga is now suffering from the same dilemma. Rotorua was a sight to behold; it’s about five years since we were there last and it’s looking better than ever. We stayed in the near-new Millennium Hotel and the cavernous foyer was filled with tourists coming and going the whole time. We booked our accommodation one day ahead on-line via my cell-phone and although the premises generally looked fine on the website they were often pretty substandard when you arrived. Despite Trivago’s glamorous TV ads that display spacious rooms as low as ninety-five dollars we paid at least two hundred dollars a night, and tended to be given the worst room in the least attractive section of the complex. Our last two nights were in Taupo, so I rang ahead directly to the Wairaki resort only to find when we got there our room was at the back corner of the complex, our view was over a service lane and there was no likelihood of sun ever streaming into our room. 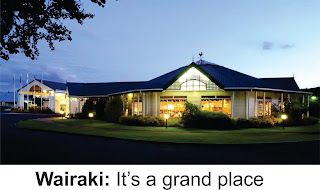 It’s a grand place; 175 acres of marvellously manicured tree-lined grounds, with tennis courts, a nine-hole golf course, unique geothermal features which allow for two heated swimming pools, and over 200 rooms. My guess is that less than twenty of these were occupied while we were there and yet we got the same standard of accommodation as if we had booked through an agent. In the last few years we have generally holidayed in Australia which is a cheaper destination than New Zealand. We will often rent an apartment on the Gold Coast adjacent to a beach with three bedrooms and two bathrooms, a large lounge and a well-appointed kitchen. All this for $750 a week. In an effort to encourage us all to holiday within our own boundaries Tourism New Zealand used to say: “Don’t leave town ‘till you’ve seen the country” and feature a Kiwi kayaker who was about to go over Africa’s Victoria Falls. From our experience, they’ll have to do better than that. You'll truly wish you hadn't read this. Will homes of the future need kitchens?